One of the most popular series of books on our “want” list Is Park Bok Nam’s 2 volume set, Fundamentals of Pa Kua Chang. Both volumes have been out of print for several years. A while back, Plum reprinted the 2 disk set, and we are happy to announce that we now FINALLY have, back in stock and fresh from the press, Volume One of the books. Volume Two will, hopefully, follow in several months. For those waiting, wait no more! 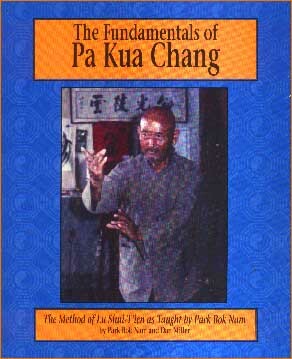 And for those unfamiliar, here is Volume One of one of the most recommended books on Pa Kua Chang (Bagua Zhang). A Note for our international customers: After months of restructuring, Plum has a new system which makes shipping MUCH LESS EXPENSIVE. As of this time, it’s working: international customers are saving 20-30% on shipping RIGHT NOW! Posted September 13, 2016 by Plum Staff. Comments and trackbacks are open. Follow the comments feed. Tagged with: Bagua, Bagua Art of Change, Bagua circle walking, Bagua pole, Baguazhang, dan miller, Lu Shui Tien, pakua chang, park bok nam. These books are incredible. I had copies of the original editions several years ago. After reading sections of both, and perusing the rest, I realized that it would take decades to master BaGua and the material these books held. Because I had been studying Taiji for a while, and realizing that that was all I had had time for, I passed these books along. I’m inclined to reacquire them, just to have them in my martial arts library, and to try to apply some of the lessons therein to Taiji. For those of you who practice BaGua, consider yourselves lucky. There are no texts that are as good as these for Yang style Taiji (for which, in my opinion, there are many lost gaps that I have only been able to fill in by researching other arts). For those who don’t want to dabble, and just want to learn a single art that has everything (maybe except ground wrestling, which is anathema to the internal arts anyway, and in general not a good idea in real combat), and will reward a lifetime of practice, BaGua is definitely a way to go.